I have run the Library’s descriptive text through Google translator. The results are unclear. My interpretation of the translation is that this particular clip represents a fragment of a longer film about dance. The original piece likely involved four sections, each with different costumes, and shot in different environments. The dance demonstrated in the extant clip was described in a contemporaneous review as “a soft, gliding Boston,” as danced in a “modern salon.” The missing clips apparently included a gavotte, a minuet, and a dance performed in some sort of 1860’s costuming (Google translator has failed to illuminate what dance this might have been). Although the original clip was silent, predating talkies by nearly twenty years, the Library has added music by modern composer Matti Bye. This is a wonderful little clip. There are few surviving films from 1908, and fewer still that focus on dance. This particular clip, while fragmentary, is in lovely condition, and the waltz section appears to have been preserved in its entirety. The Boston is a dance that I have never encountered in such early original footage. It was, however, detailed in a variety of print publications. Caroline Walker, for example, described the Walking Boston and other Boston Variations in her 1914 book The Modern Dances. Similarly, Eileen Swepstone addressed the Boston Glide in her 1914 pamphlet How to Dance the Tango, Hesitation Waltz, and Other Popular Dances. 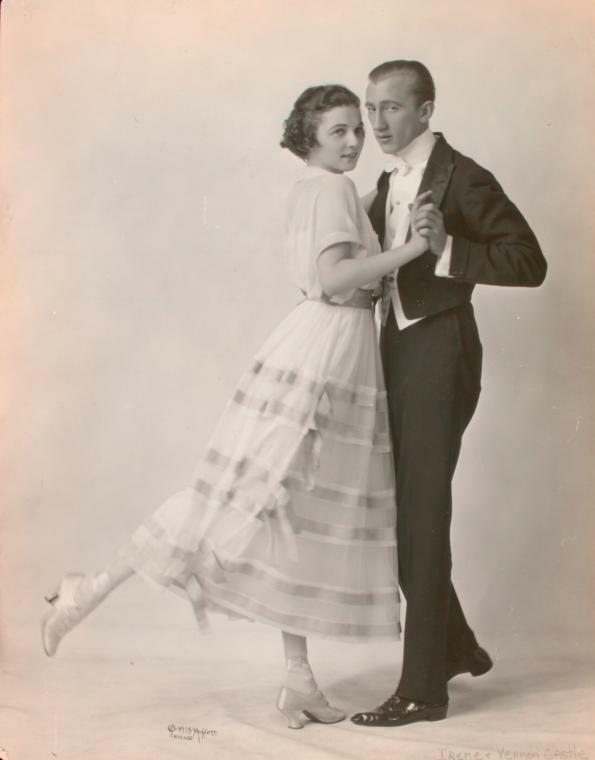 Neither Ms. Walker’s Walking Boston, nor Ms. Swepstone’s Boston Glide seem to sync precisely with the 1908 video footage at the National Library of Sweden, except that all are waltzes. This is unsurprising, since “Skilda Tiders Danser” is segregated from these accounts by six years and an ocean. The performers in “Skilda Tiders Danser” are both women. According to the title card, Emma Meissner performs as “damen”, (lady), while Rosa Grünberg dances as “kavalgeren” (“leader”, according to Google translate.) Ms. Grünberg, unusually, dons menswear for her role. This strikes me as a particularly bold, forward-thinking choice for a woman in 1908, predating as it did society’s acceptance of pants for women by several decades. Perhaps Sweden was especially liberated. Perhaps Ms. Grünberg was. If any experts on twentieth century Swedish social mores ever stumble upon this site, I would love to hear from you on the subject. A little internet research reveals that both ladies involved in this clip were successful sopranos and actors who performed on both stage and in film. Ms. Grünberg’s crossover success was significant enough to merit an English Wikipedia page as well as a Swedish one. Should you desire to hear Ms. Grünberg sing, the website Forgotten Opera Singers, which specializes in rare operatic recordings, affords you the opportunity. Ms. Meissner’s Swedish Wikipedia page can be found here.